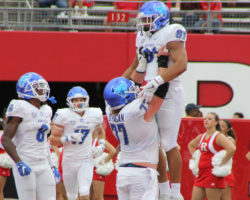 The UB Bulls are one of 21 remaining undefeated teams in FBS. Scott Wilson and I look back at UB’s road demolition of Rutgers and preview this week’s home game against Army. The Bulls are one of 21 remaining undefeated FBS teams. THE NUMERICAL: Let’s talk win probabilities! * Who gets the NY6 bid: 13-0 UNT or 11-1 UCF?